The Samsung Exynos 5 Octa (also called Exynos 5410) is a system on a chip (SoC) for smartphones and tablets introduced in early 2013. Its first major application is the Samsung Galaxy S4. The SoC offers four Cortex-A15 cores clocked at 1.6 to 1.8 GHz. Compared to the commonly used Cortex-A9 architecture, the A15 cores offer roughly 50 percent higher performance per MHz, which makes the Exynos 5410 one of the fastest smartphone SoCs of 2012. In addition, Samsung has integrated four Cortex-A7 cores, which are much more efficient and clocked at up to 1.2GHz. Depending on the load, the SoC automatically switches between the A7 and A15 cores to improves power consumption and battery life. This concept, developed by ARM, is called "big.LITTLE". It is theoretically possible to address all 8 cores simultaneously. The PowerVR SGX544 GPU is licensed by IMG (Imagination Technologies). The Exynos 5410 integrates the MP3 model, which offers a total of 3 GPU cores clocked at 533 MHz (51.2 GFLOPS). The SGX544 supports OpenGL 2.1, OpenCL 1.1 and DirectX 9.0 and performs similarly to the Adreno 320 as found on Qualcomm's Snapdragon S4 Pro. Compared to the fastest tablet SoCs like the Apple A6X or the Exynos 5250, the Exynos 5410/SGX544MP3 falls a bit short. Nevertheless, Android games will play fluently even in 1080p. 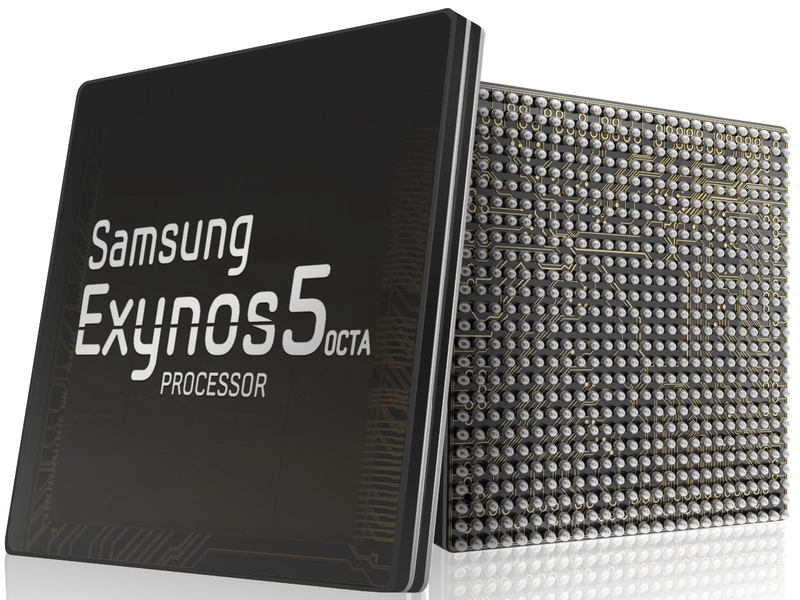 To be suitable for smartphones, the Exynos 5 Octa should have an estimated maximum TDP of about 3 to 4 Watts. It is possible for full load to cause slight throttling, which is common amongst SoCs.